Calico Ghost Town, in California's San Bernadino County, may not fit your expectations of a ghost town. It's not deserted and many of the buildings have been restored. It's a fun place, popular with tourists. In fact, it's now a regional park surrounded by desert. Calico is more like Tombstone or Superstition, Arizona than less-touristy old towns like Bodie, California or Rhyolite, Nevada. Some feel it is too commercialized. Calico started out as a silver mining town. It popped up in 1881 during a silver strike, which was the largest one ever found in California. The town boomed, but only until the price of silver declined in 1896. By 1904, it was abandoned. Walter Knott, of Knott's Berry Farm fame, purchased Calico in the 1950's. He restored all but five original buildings to look as they did in the 1880's. Calico received State Historical Landmark status and in 2005 was proclaimed by then-Governor Arnold Schwarzenegger to be "California's Silver Rush Ghost Town." You can visit the old town for a day trip or you can spend the night there. Bring your tent or RV or stay in one of their basic cabins. Calico is located between Los Angeles and Las Vegas and makes a good place to take a break on the trip. Kids love panning for gold in at Calico. They also love the Mystery Shack, a mind-bending spot where optical illusions make the water look like it's running uphill. And they get to have a great time riding the narrow-gauge mining train that circles the town and taking the stagecoach ride. Adults will enjoy the museum, the Maggie Mine, an authentic silver mine from the 1880's, with mining exhibits and historical displays, and checking out the fourteen shops and the western themed eateries. Calico hosts a special event for almost every holiday of the year. That includes Easter, Halloween, Thanksgiving, and Christmas. They also put on a film festival, Civil War reenactments, and a bluegrass music festival. The Calico Days Festival is when the town’s rich mining history is celebrated with fun things to watch like a burro race and miner’s triathlon. There's music and more going on. At Halloween, go to Calico for the popular Halloween Ghost Haunt. There are off-highway vehicle roads in the desert surrounding the town but they warn about getting too close to the old mine shafts in the area. Those fascinated by the desert may want to stop in to see the Desert Discovery Center in Barstow. The Desert Discovery Center also houses the “Old Woman Meteorite,” the second largest meteorite found in the United States. 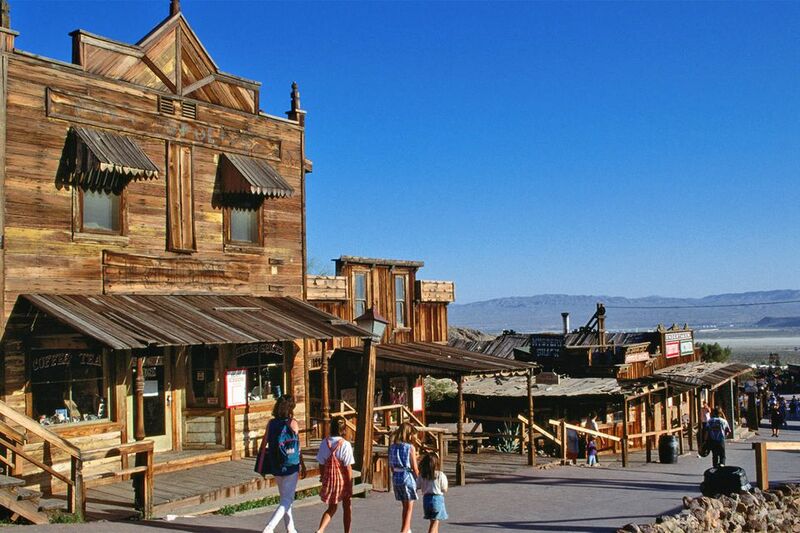 Calico Ghost Town is located just east of Barstow and is open every day, except Christmas Day. They do charge an admission fee and during a festival the pricing increases. Some attractions have an additional charge. Some things close on weekdays. The desert can be hot in summer so plan accordingly. Dogs are allowed on leash and a small fee is charged (except for assistance dogs). Because Calico is a real 1890s town, not all areas of it are ADA accessible.